Marking the beginning of the fall season, the Ohio Affiliate of Prevent Blindness (PBO) and Ohio’s Aging Eye Public Private Partnership supported National Falls Prevention Awareness Day on Sept. 21. The goal is to bring attention to this serious issue that is the leading cause of injury-related hospitalization and death among Ohioans age 65 and older. Unfortunately, those with impaired vision are more likely to experience falls and injuries. According to a 2016 study by the Centers for Disease Control and prevention (CDC), 52 percent of Ohio adults age 65 or older with severe vision impairment fell at least once in 2014 as compared with 28 percent of those without severe vision impairment. Visual impairment, which can include decreased visual acuity, contrast sensitivity, depth perception, and/or visual field, influences the risk of falls. Vision impairment can affect balance. It also increases the risk of tripping or misjudging steps, stairs or curbs. Based on data from the 2014 report “Vision Problems in the U.S.,” 1.4 million Ohioans age 40+ have vision problems that if not corrected or treated could lead to vision loss including age-related macular degeneration, cataract, diabetic retinopathy and glaucoma. More than 170,000 are blind or visually impaired. Another 2 million Ohioans have myopia or hyperopia that is correctable with a simple pair of eyeglasses, but some do without vision correction due to challenges with cost or transportation for doctor appointments. The number of Ohio residents with impaired vision, including blindness, could double in the next three decades. The Aging Eye Partnership is a charter member of the Department of Aging’s STEADY U Ohio initiative to raise awareness of the epidemic of falls among our elders. STEADY U recommends all older Ohioans have a regular, professional eye exam. Poor vision makes it more difficult to move around safely. 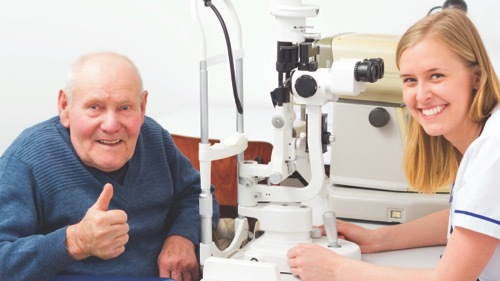 Age-related eye diseases, such as cataracts, macular degeneration, diabetic retinopathy and uncorrected visual acuity, can increase the risk of falling. Early detection is key to minimizing the effects of these conditions, and wearing contact lenses or glasses with the right prescription ensures that you can take every step with confidence. Getting 15-30 minutes of physical activity every day is another way you or a loved one can reduce the risk of falling. Walking strengthens muscles, improves balance and increases stamina, all of which can make you steadier on your feet. Participate in proven falls prevention programs like tai chi and “A Matter of Balance,” which can give you tools to build balance, strength and flexibility. Get your hearing checked annually. For more information, please contact Prevent Blindness at 800-301-2020 or visit pbohio.org. For tips and resources for falls prevention, including a self-assessment and information about community prevention programs, visit the STEADY U Ohio website at steadyu.ohio.gov.